Meriam Azizi has dedicated six years to Arab-Andalusian songs and music. 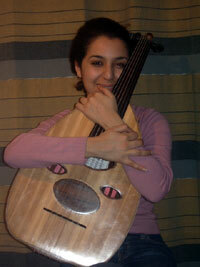 Keen on World Music, she crossed Greece and travelled Turkey with the sole aim of promoting the 'oud'. Moving to Paris, Meriam founded with Breton guitarist Ronan Vilain the Duo Bostan, blending east and west.